I received queries about making these available in other sizes too and have now produced a version that will fit A4 and A5 binders. You can download it as a Word file or as a PDF file. If using the PDF versions remember to set your printer settings so as not to shrink the pages. If printing for the A5, you have a choice. You can either print the file double-sided as a conventional A4 page and then cut it in half, or you can print in booklet mode. Doing the latter will give you a finer grid. It's hard to describe, but try and you'll see what I mean. Of course, you don't need to put this paper in a Filofax at all. It works pretty well as loose paper for taking notes, making sketches and particularly for things like hand-drawn flowcharts. Thanks for these. 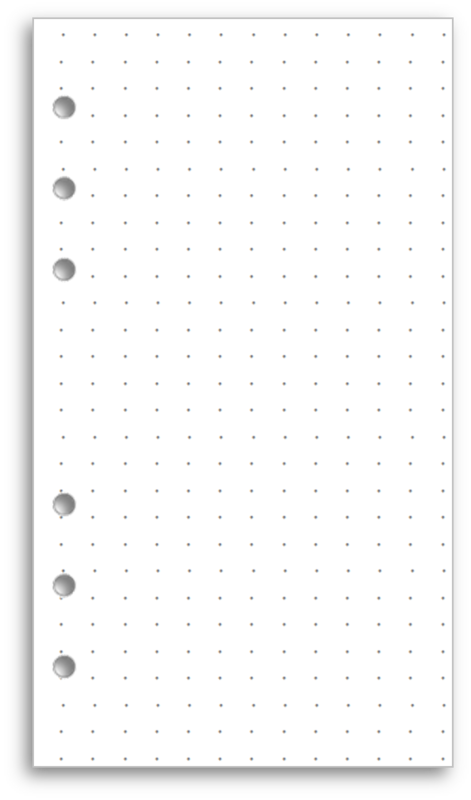 I have already used your personal sized version, but the A5 is my desktop random notes pad, which eventually gets filtered and 'downloaded' into a bound notebook for keeping. 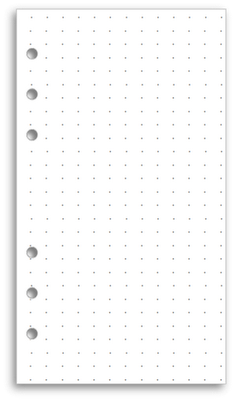 The dots guide you in both portrait and landscape, but without the clutter of grid lines - perfect. Is there one for a pocket filofax? Yes. The search box will get you there or follow the link for free inserts at the top of the page.